A little while ago, when fruit infusions were very much on trend, I tried cucumber and water. I know this might not sound exciting, but I swear cucumber in water beats any selection of fruit or berries you can think of. I know it isn’t the most exciting vegetable, but trust me on this it was meant to be drunk. Cucumber added a level of refreshing I simply hadn’t been expecting. I have to admit I thought at the time that I couldn’t work out why there weren’t more drinks with cucumber available commercially, but then Winter came and I forgot all about it. 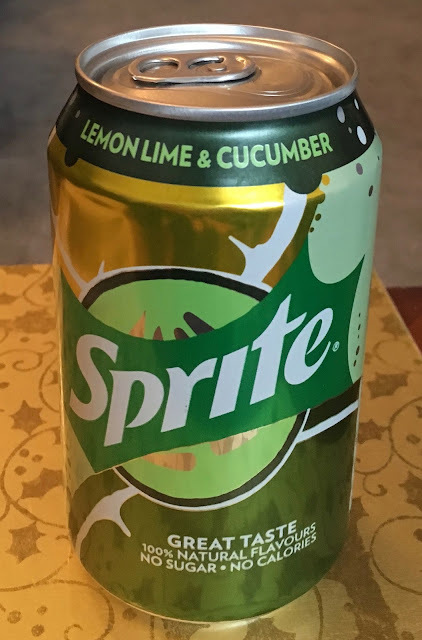 As spring finally hits, Sprite seems to have seen the magic in cucumber that I had last year, and I was super excited to see this Sprite Lemon, Lime and Cucumber listed on Ocado. I actually had to make myself wait for it to chill in the fridge after the delivery arrived, I was so keen to just pop the can straight away. When I finally did open the can it fizzled pleasingly as I poured it into my glass. I gave it a sip and let the flavours wash over me. There was plenty of of the usual lemon and lime to identify itself as Sprite, but the cucumber worked its magic touch. The cucumber tasted fresh and cooling and partnered with the lemon and lime made the perfect drink for a warm day. This is a soft drink aimed at the grown up market, and I will gladly lap it up. Its refreshing, different but still has the lemony goodness of Sprite. Possibly the most refreshing drink available in a can, for those that like cucumber that is.